So, the pleasures of dorm life were brought home to us about 3am when our fellow traveller returned from a night out, blazing a torch around the room, for what seemed like half an hour, farted loudly, giggled and went to sleep. 2 hours later our fellow Belgium travellers got up for their flight home and we were then up at 6am for our train to Sweden. To say we were grumpy and tired is probably not required but I will anyway. We walked the 100 yards down the street to the train station observing the litter that was everywhere! Saturday nights here are obviously great! We were so early at the station that we entered the platform before the international barriers had been moved into place. Train left on time at 7.16 with about 6 people on board which probably says something about the Danish and not being fond of getting up after a Saturday night out. I dozed like a nodding dog on the train, by the time were were a few hours in I was also becoming slightly itchy which I put down to being tired and sensitive. 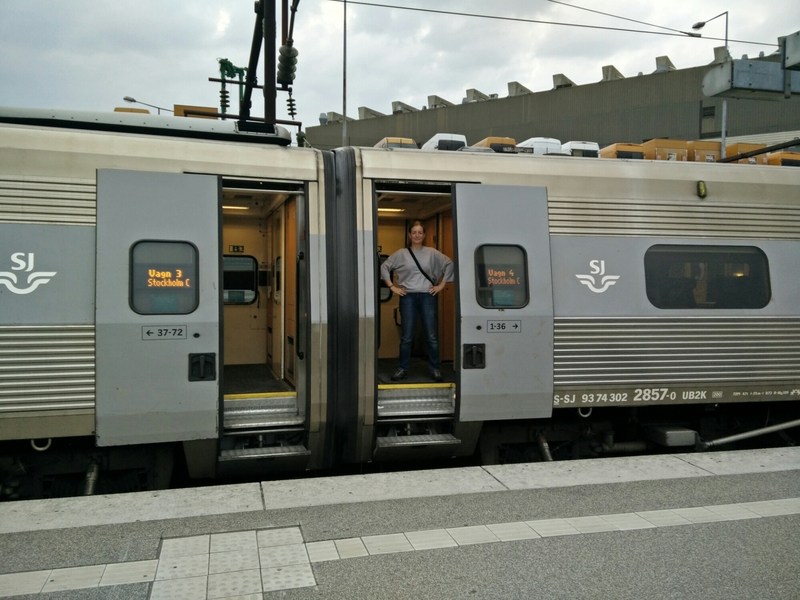 The train quickly filled up on leaving Malmo and we had luckily been allocated seats in the quiet zone so were able sleep and read when we liked. I also heard my first’tut’ when someone’s phone went off. The views through the train window were stunning, pine forests, lakes, the odd mountain, more pine trees and more lakes with a few wooden houses dotted throughout – exactly what you would expect from a Swedish holiday brochure. Arrived in Stockholm on a Sunday afternoon with blue skies above. Walked 20 mins, mainly uphill, with increasingly heavy backpacks to get to the hostel. We are wishing it was winter so we could wear more clothes and have less to carry. On check in, we were shown to our room which was spacious and had an ensuite. OMG! We were over the moon! Who cares there was no window, ensuite and space more than made up for that. As it was only 2.30 we made our way into town to a local food stall we had seen on the Hairy Bikers show that sold herrings, in all kinds of ways. We walked through the main shopping street with all the usual names- H&M, Starbucks, Joe and the Juice (Skandi chain which is fab), Zara, burger king etc etc. We got to the end and over to the next island which was crammed with Sunday strollers out for a slow walk. Unfortuntely we weren’t, we were hungry and tired and needed a herring fix NOW! Without elbowing too many locals out of the way we made it over the next bridge and to the food stall nystekt stromming. 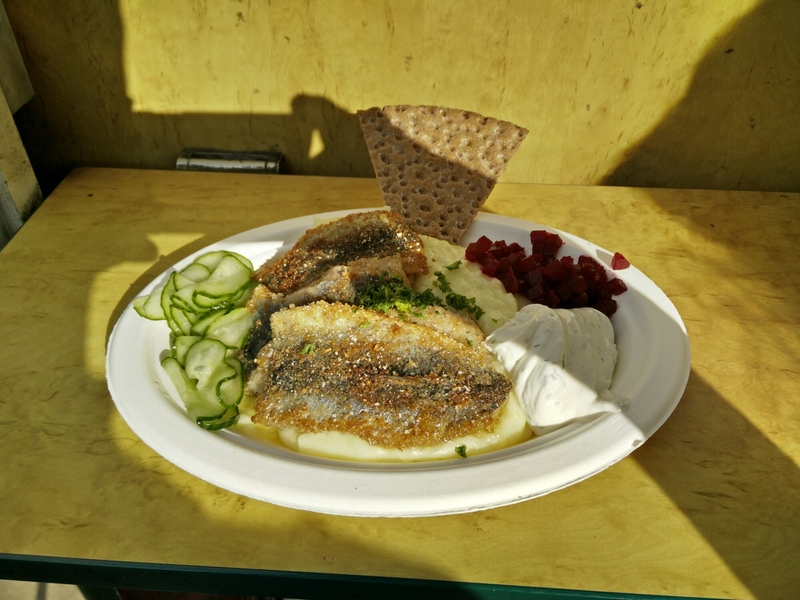 There was a small queue but he was still selling herring so we waited patiently and got a plate of herring, mash, and three accompaniments (for £7.50) and it was delicious! My accompaniments were the best, the mustard sauce was sweet and goes so well with the oily fish. It was healthy and delicious, what more can you want? Less grumpy we ventured further into Stockholm and weren’t that impressed but I think we had been spoilt by Copenhagen. All the bars were either English, Irish or American it seemed really difficult to see what a Swedish bar was like so after a wander and a pint (Swedish beer- nice, nothing too special) we headed back to the supermarket over the road for Supermarket Tea. 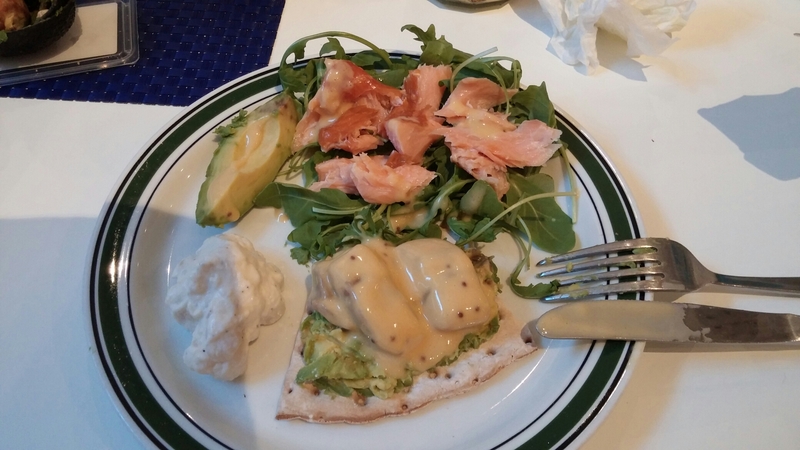 This time it consisted of pickled herrings, smoked salmon, rocket, kartoffelsalat (creamy), smashed avocado and gluten free crispbreads. It was delicious. We had also looked for a cheeky glass of white wine to accompany this fine dinner but to no avail. On googling Booze in Sweden we found out that hard liquor (as anything over about 3% is known in Sweden) is licenced by the Government and only sold in shops open til 7pm or closed on Sundays, healthy lifestyle it is then. By this time I was becoming increasingly itchy and disgruntled. On checking my face, arms and legs small bites were appearing, in small clusters, reminiscent of bed bugs, the memories of Asia came flooding back. Paying £35 for a bunk bed and getting bed bugs was a little disheartening. Had an enforced lie-in trying to be quiet in the dorm. After station food breakfast we hired bikes and set off into the sprawling cycle lanes of the city. 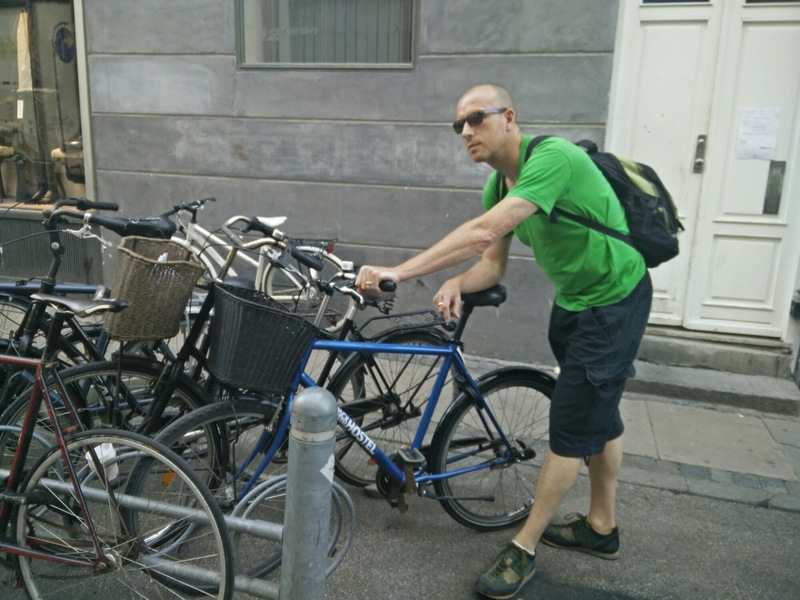 Copenhagen is very commuter friendly. Everyone stops for pedestrians on zebra crossings and cars also give way to cyclists when turning left at a junction so together with a flat terrain and miles of cycle lanes it’s perfect for foreign novices to get stuck into. We headed through the city, dodging drunks emerging from bars (10 am – 24 hour city) to the waterfront and back round to the little mermaid. Coming past the Star Fort a motorbike outrider stopped the coach in front of us but instead of a cycle race coming through, around 100 people on vintage bikes dressed in 1940s styles drifted by smiling and waving. Further down the road we passed a massive organised running event with pompom-ed cheerleaders at the finish line. Feeling peckish we attempted a new land speed record on gear-less bikes with baskets and headed to the meatpacking district for lunch. 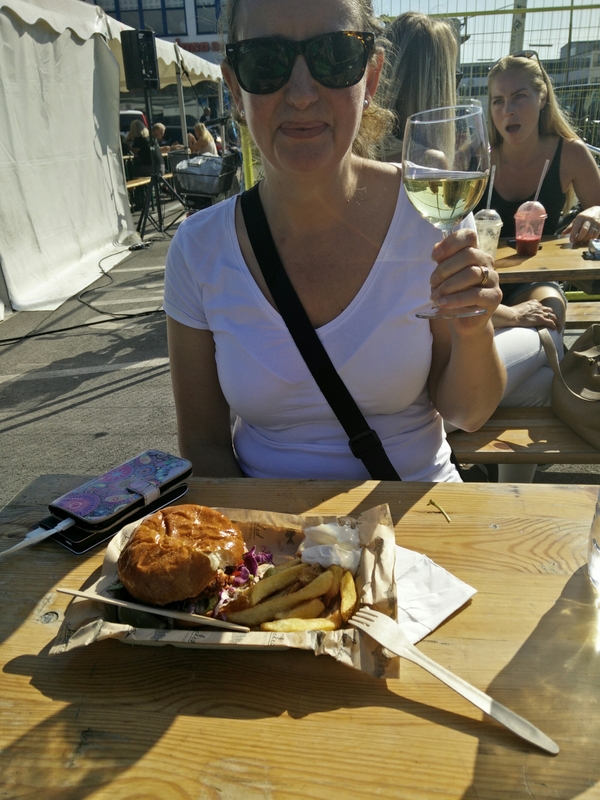 A pop up food fair provided salmon burger with white wine (Al) and a rare beef steak baguette with red (me) to the backdrop of locals dancing salsa in blistering 27° sunshine. All paid for on cards with card readers plugged into ipads. Back on the bikes and we spent a wonderful afternoon bar crawling across the city. For me it’s up there with tapas crawling in Barca or sushi crawling in Japan as a great way to have a few beers. Crossing the city through the safe cycle lanes, park your bike outside the bar and after a relaxed drink off you head somewhere else. Very civilised. For tea we headed to the paper island where dozens of food stalls reside in an old warehouse a lot like Digbeth Dining club in Birmingham but with 100s more people. 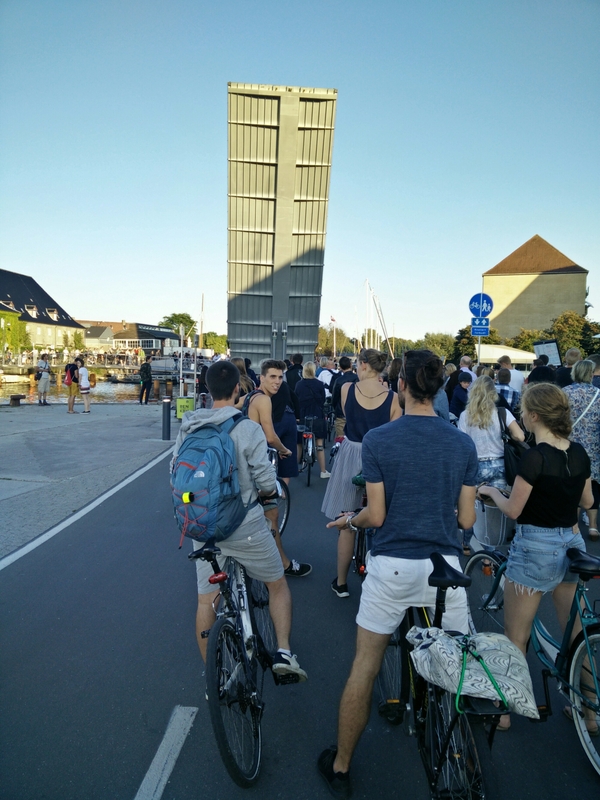 We were held up on the way by a bridge being raised to let some yachts through and in no time dozens of people were queuing patiently on foot or bike without tutting. It only added to the anticipation of the food which was worth the wait. 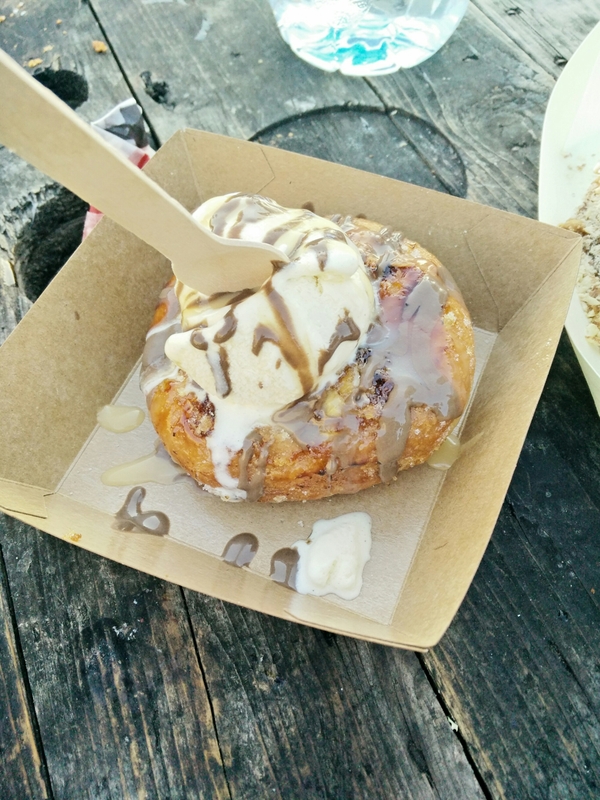 Danish apple pudding with cream, almond and toffee cheesecake but the best was the creme brulee donut. Copenhagen had stolen our hearts and we pondered just staying here for 6 months before heading home to work, but a new country beckons tomorrow so we say Tak og farvel. Up early for the train to Copenhagen. 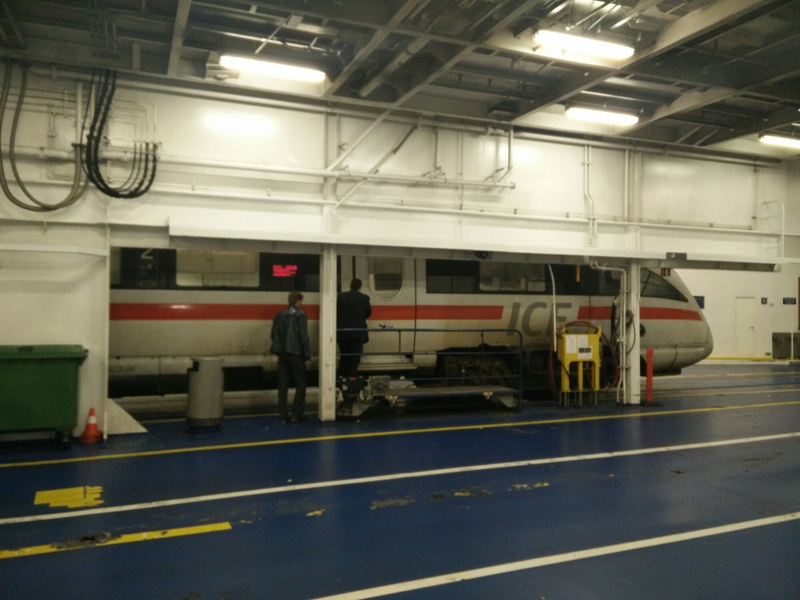 We both commented on how short the train was and realised why when it drove onto a ferry to cross the water to Denmark. (For any train geeks, it was the most stylish interior so far). We walked the 50 metres to the hostel and dropped our backpacks before setting off to explore with enthusiastic excitement at popping our Scandinavian cherry. 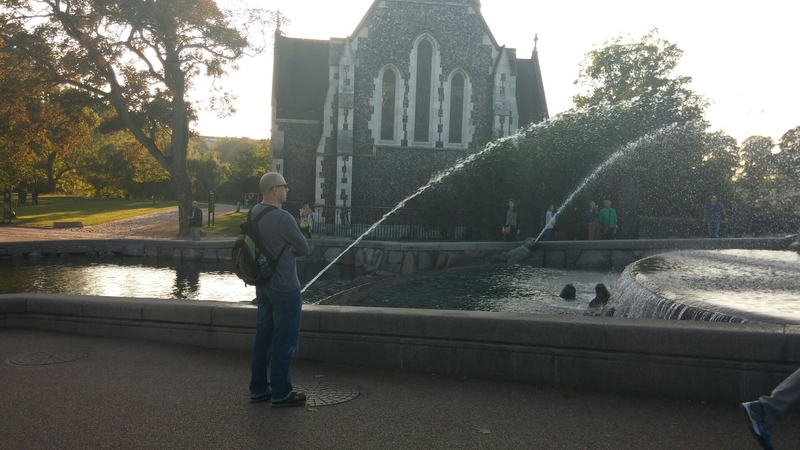 Copenhagen is beautiful. Grand architecture, picturesque back streets and canals lined with quaint cottages and a cafe culture with very friendly English speaking locals. We would also discover that the locals like a beer. 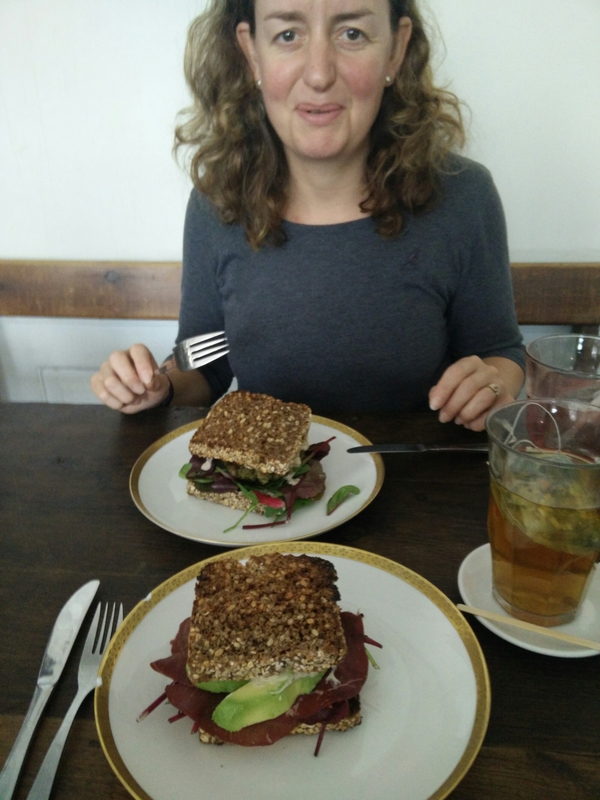 We stopped for a posh butty with salad and fish in a small place which was possibly the coolest cafe I’ve trodden in. A really old building with ancient features big old tables and chipped crockery. New is not always better. We checked in to our luxury 6 berth spacious dorm and wondered what our room mates would be like (best case = Danish women’s beach volleyball team. Worst case = Spanish stoners who shout instead of sleeping). The hostel recommended a bar which was handily located at the start of a self guided city tour so off we hiked via two dark imperial stouts. Our walk was bathed in glorious late summer sunshine and the city was coming out for Friday night so the atmosphere was fabulous. 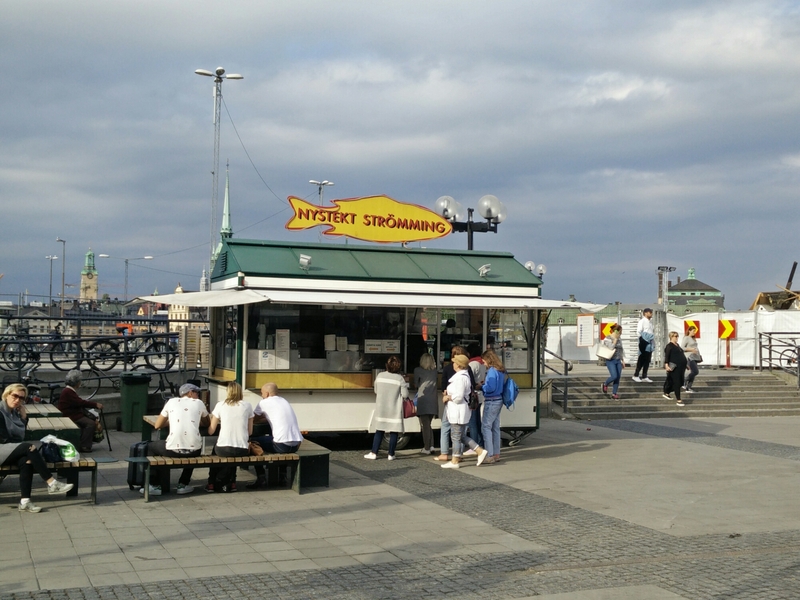 We entered a park where families and friends sat together drinking and soaking up the sun and as we try and always fit in we returned to a Netto we had passed for beer and reindeer salami and then to the park to observe the locals. Picnic finished, we walked down to see the little mermaid and use the facilities. Walking back to the centre we came across a canal lined with bars and restaurants heaving with Copenhageners enjoying a Friday night. Sat across from them along the canal edge were more budget revellers indulging in cans of carlsberg and tuborg. We headed straight to the nearest can shop. The beer tasted sweet and the atmosphere was so enjoyable we decided to splash out on a second can, I returned from the shop to find Alison being “wooed” by a tanned suited local lothario. Tempted to just watch, I decided to do the right thing and rescue her by pushing him into the canal (joking). Amazed by our frugality of drinking tins in the park and by the canal we thought we’d have one for the road in a building. Before you could say “We’re British” we came across the Lord Nelson selling pints of ale and playing 80s British rock. Perfect. Heading home we saw the party bus sponsored by Malibu where drunk young revellers are driven around having a disco in a bus. Coming to the UK soon? Finally we got home to find an aussie girl waiting up for us in our dorm. Neighbours eh?